The Direct Food and Ag Marketing Team is focused on providing training, education, and technical assistance to Ohio’s food producers and marketers. The goal of this assistance is to help these small businesses increase their effectiveness and, thereby, their profitability. This should translate to healthier farms, food producers, and communities where they reside; and increase access for consumers to locally produced foods. MarketReady – A one-day workshop that helps local food producers explore various market channels including direct to consumers, direct to restaurants, direct to wholesale, and direct to institutions. The workshop focused on the main business functions for each of these market channels. 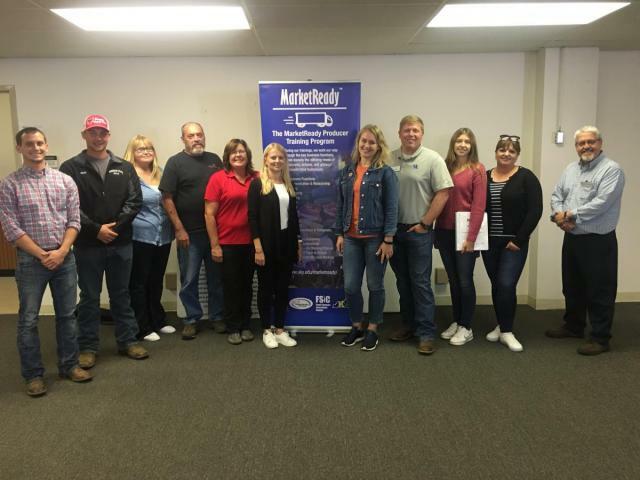 The trainings were delivered 31 participants and were held in conjunction with OSUE Cuyahoga and Brown Counties and the University of Kentucky’s Center for Crop Diversification. An attendee said of the training, “the diversity information, the networking, and the transparency are what I liked best about MarketReady.” Another said they valued all the expertise from the different presenters. In addition to the previously mentioned collaboration, Ivory Harlow of the Center for Cooperatives shared information about cooperative development and marketing with the attendees. The Appalachian Table, Where Local Food Buyers and Producers Meet was held for the first time at OSU South Centers. The Appalachian Table event brings food producers, businesses, and buyers to the table to experience a local foods meal, make meaningful connections, and spark interest in the diversity of products produced in the Appalachian region. The event provides a forum to share information, learn best practices, and facilitate peer-to-peer learning and networking. Potential buyers are exposed to a wide variety of locally produced foods from the Appalachian region of Ohio. The event features an all-local foods breakfast including coffee, baked goods, proteins, dairy, and grains. Producers have an opportunity to learn how peers are successfully marketing through various channels including major retailers, farm-to-fork restaurants, community-supported agriculture programs, and direct-to-consumer markets. During the 2018 event, Sleepy Bee Café’s founder, Sandra Gross, and Executive Chef, Francis Kroner, shared information with attendees on how they procure locally produced foods for three restaurant locations in the Cincinnati area. The team is participating in a Connect & Collaborate Grant project with Dr. Abby Snyder, Field Specialist, Food Safety & Management with OSU Extension. The project began in December 2018 and will continue into 2019. The Direct Marketing Team is assisting with the objective to provide technical services for processors by funding a process analysis service needed in product development and regulatory compliance. Marketing Matters – Free monthly marketing presentations that are delivered through online streaming and the team’s YouTube channel. Additional marketing presentations were given at the Ohio Produce Growers and Marketers Association, The University of Rio Grande’s business class, AgritourismReady Conference, The Ohio & West Virginia Food Hub Network, and many more. In addition, team members continue to participate in a variety of groups throughout Ohio including: Pike County Local Foods Group, Initiative for Food and AgriCultural Transformation (InFACT), The National Farm to Cafeteria Conference organized by the OSU Farm to School program, OPGMA’s educational committee, and the National Farmers’ Markets Working Group. The team published the factsheet; Accepting Supplemental Nutrition Assistance Program (SNAP) benefits at Ohio Farmers’ Markets and is available via Ohioline. If you would like to be a member of the Direct Food and Agricultural Marketing Team or would like additional information please contact Christie Welch, welch.183@osu.edu.